Master Splinter, Ninjara and the TMNT have traveled the globe to visit the Sensei’s old teacher, Charlie Llama, in the Crystal Palace in Tibet. On their way they met a four armed tiger man named Katmandu who was on his way to the Palace to guard the Llama. Unfortunately, upon their arrival, our heroes find the palace in shambles – and a four armed skeleton escapes their grasp. Katmandu explains that this building is the home of the evil sorceror Mang-Thrasha. Typically, the wizard does not involve himself in the lives of men – so the tiger warrior is surprised that he has kidnapped Charlie Llama. As the protaganists decide what course of action to take against Mang-Thrasha, Jang La suddenly goes into labor. The TMNT take her back inside the Crystal Palace and make her as comfortable as possible. Soon, a group of monkey monks called the Tantric Monkeys arrive. Leo, Mike, Raph, Ninjara and Katmandu leave for Mang-Thrasha’s palace as Master Splinter, Don and the Tantric Monkeys help Jang La during her birthing. The group of heroes arrive at the foot of the mountain holding the evil sorceror’s palace and soon run into a strange mist. Raph and Ninjara are separated from the others due to the fog. Mike, Leo and Katmandu are attacked by two dervishes. 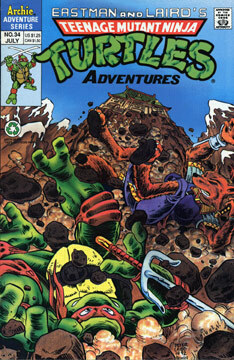 Meanwhile, Raph and Ninjara spot the palace and begin to climb towards it – when the mutant turtle loses his grip and causes an avalanche that carries both ninjas down the mountain.